Spenco MTB Heat Wave Glove | OhGizmo! Here I am feeling guilty for sitting at a computer all day and worrying about the inevitable carpal tunnel syndrome when it turns out that even those living an extreme lifestyle like off-road mountain bikers share the same risks. Typically after a long trek off-road riders can experience numbness in their hands due to constant vibrations from the bike rattling the carpal tunnel or median nerve in their hand. The MTB Heat Wave glove helps drastically reduce the amount of vibration hitting this nerve thanks to strategically placed gel pads. 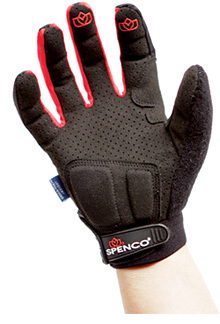 The Spenco MTB gloves with this patented ‘Shock-Tek’ technology currently come in 3 versions. The ‘Trail Pro’ which is a standard model, the ‘Heat Wave’ which is designed with extra ventilation for warm days and the ‘Cold Snap’ which has additional fleece lining for those cold spells. Depending on the specific size or model the MTB gloves all run between $30-40.